alaTest has collected and analyzed 21 reviews of Canon HF11. The average rating for this product is 4.3/5, compared to an average rating of 4.0/5 for other Camcorders for all reviews. People really like the price and size. The portability and image quality also get good feedback, whereas there are some critical reviews about the viewfinder and battery. We analyzed user and expert ratings, product age and more factors. 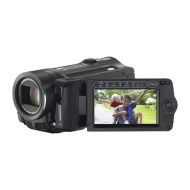 Compared to other Camcorders the Canon HF11 is awarded an overall alaScore™ of 85/100 = Very good quality. Good picture quality, as photo 2. If you shoot inside you have to shoot so far away to get people inside the image. So u need to buy lens.Battery last only 1 hour.